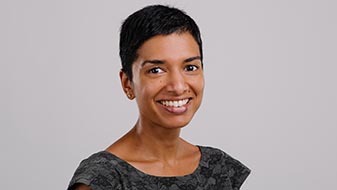 Dr Priya Sumithran from the Medicine, Austin Health node of the Department of Medicine and Radiology was recently awarded a prestigious David Bickart Fellowship for five years providing funding exceeding $420,000. This competitive funding was awarded to allow Dr Sumithran to continue her cutting-edge research into obesity, focussing on the regulation of body weight and the improvement of treatment outcomes for people with obesity. Obesity is a major global health problem, affecting more than 400 million people worldwide and is associated with chronic diseases including cardiovascular disease and type 2 diabetes. Dr Sumithran is an internationally-recognised leader in the study of body weight regulation and has published and presented extensively in this area. She is a clinician-scientist allowing her to directly translate research findings into clinical outcomes while also ensuring clinical practice and evidence informs her research, ensuring its relevance and topicality. She is a worthy recipient of this award and has great promise as a global research and clinical leader in obesity treatment and body weight regulation.